Karaite liturgical poet; flourished in the first half of the tenth century. He compiled a prayer-book for the Karaites, entitled "Tefillat Bene Miḳra," in which he inserted many poems and prayers composed by himself. The prayers were interwoven with homilies, Biblical explanations, arguments in favor of the Karaite dogmas, and polemics against the Rabbinites. 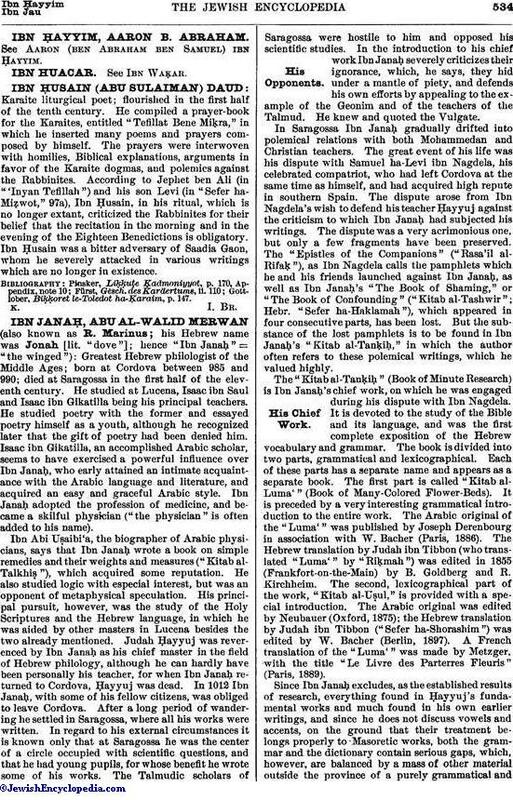 According to Jephet ben Ali (in "'Inyan Tefillah") and his son Levi (in "Sefer ha-Miẓwot," 97a), Ibn Ḥusain, in his ritual, which is no longer extant, criticized the Rabbinites for their belief that the recitation in the morning and in the evening of the Eighteen Benedictions is obligatory. Ibn Ḥusain was a bitter adversary of Saadia Gaon, whom he severely attacked in various writings which are no longer in existence. Gottlober, Biḳḳoret le-Toledot ha-Ḳaraim, p. 147.